Recently my good friend and I decided to have lunch together and she suggested her favorite Singaporean restaurant. Having a husband who is from Singapore, and having lived there herself for a number of years, I deemed her the authority on the cuisine and eagerly followed her lead. The name of the restaurant is Hainan Jeefan Shokudo and it’s located in the Azabu Juban section of Tokyo, just behind, sort of catty-corner to the big Lincos Supermarket and Tsutaya that are at the bottom of Keyaki Zaka – Roppongi Hills. It has a neat stone entry and about three tables outside. Inside it is sparsely decorated with dark wood and simple, spare tables and chairs. 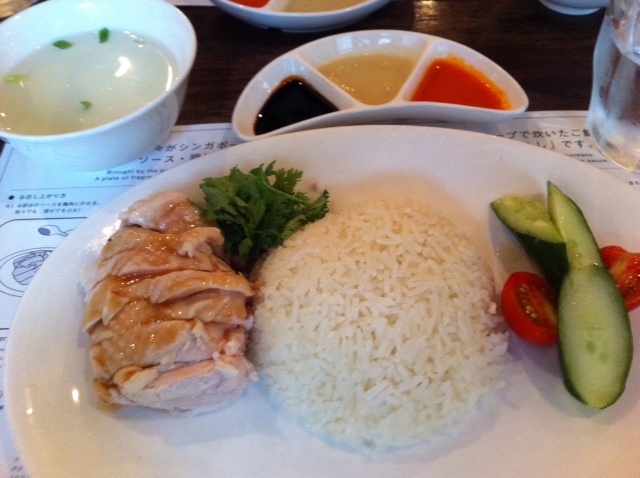 At lunchtime at this restaurant, there really is no other choice of fare besides chicken rice. Oh, there’s one other dish of the day that’s usually spicy, but most people go there for the chicken rice, which, according to my friend, is pretty much the national dish of Singapore. It is a full plate of tender, steaming chicken which is tender enough to cut with the side of a fork (one only receives a fork and a spoon for utensils) along with a refillable (free) dollop of sweet jasmine rise, and pickles. One the side, also refillable, is a dish of three sauces – one sweet, one spicy and one ginger. The idea is to cut the chicken, scoop it and some rice onto the spoon, and then dip it into one, two or all three sauces before putting it into your mouth. Also on the side is a bowl of very plain chicken broth with a hint of pepper in it – that’s for drinking. 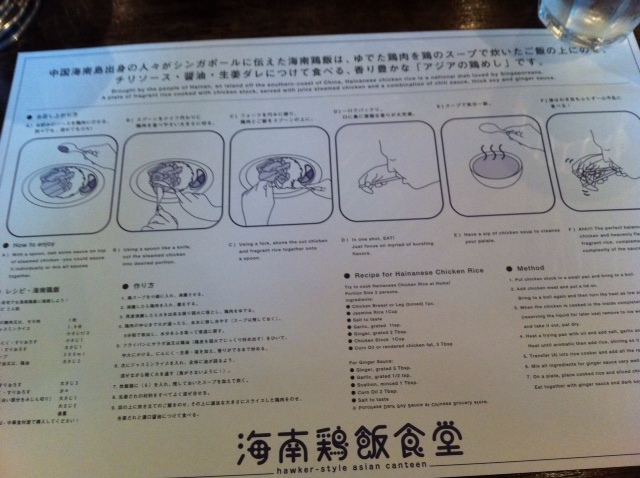 At each space is placemat that details precisely HOW to eat Singaporean Chicken Rice. Make no mistake: there is a proper method to eating this dish. There’s a way to use the utensils in tandem to get the most flavors into your mouth at once so you can fully appreciate the “complexity” of the tastes as they cover your taste buds. The soup is so you can cleanse your palate between bites. I’m not sure what the pickles are for – they could be a side dish that lends it a little Japanese ambiance – pickles are very Japanese. But they, too, are so mild that they could be meant for palate cleansing. It was all delicious. I tried my best with the method, but I ended up looking mildly ridiculous, of course. But in the end, they are right – the mix of tastes does wander around on the tongue so that each flavor stands out at a different time in the chewing and swallowing process. I could taste every bit of of the sweet and savory mix. The serving was perfect too – just enough to be filling without over-stuffing. Some people had extra rice, and we did have extra sauce (which just somehow appeared before us – the staff is quiet, but omnipresent) but otherwise it’s the perfect lunch portion. I’ll have to go back for dinner and report on a hopefully expanded menu, but with just as good service and food. My favorite thing about eating in Asia is that every meal is experiential. It’s not about just taste or smell; often there’s elements of touch and sight involved also. The method of consumption is just as important as the dish itself. A big thank-you to my friend who took me there – I’m sure to go back!